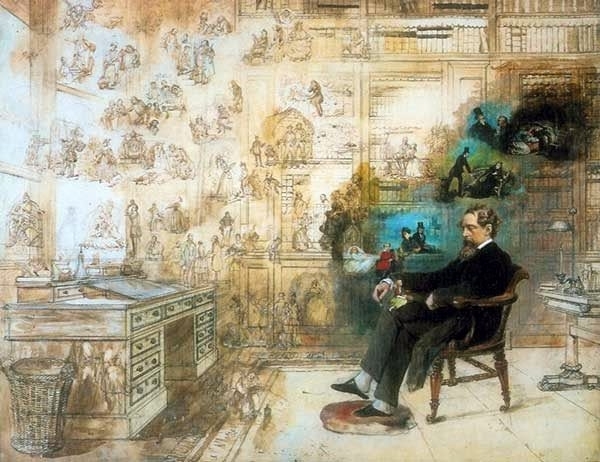 Saturday, December 12th sees the The Dickens Project re-open its gates for a week-long celebration of Charles Dickens and his work. Centred on A Christmas Carol, which will be read throughout the week by staff and guests of Seanchai Library, the Project features so much more as well. Originally conceived under the Storyfests SL banner (Storyfests being the special events “spin-off” from Seanchai Library), The Dickens Project was first presented in 2012, as a part of activities being held around the world to mark the 200th anniversary of Charles’ Dickens birth. Over the course of two weeks, thousands of visitors passed through the project’s gates, explored the life and times of Charles Dickens and attended presentations of A Christmas Carol and other works by the author. In December 2013, The Dickens Project allowed Seanchai Library to further bridge the digital divide when a special reading of A Christmas Carol was held, with Caledonia Skytower, in her alter ego of writer Judith Cullen, narrated the story to an audience attending the Knights of Pythias Temple in Tacoma, Washington States, and to an audience in Second Life. At the same time, Kayden Oconnell and Shandon Loring appeared in-world and also at the Teemple, courtesy of a big screen.After the presentation, the audiences in Second Life and at the Temple were able to interact with one another, with the latter able to learn more about Second Life. Now firmly established as a part of Seanchai Library’s seasonal calendar, the 2015 edition of The Dickens Project will take place in the Community Virtual Library’s exhibit space. All activities throughout the festival are free to attend, and any donations received will be awarded to the Community Virtual Library: a registered 501(c)(3) non-profit organization, connecting residents with information resources, reference services, and serving as a networking tool for information resource professionals. The programme of events for The Dickens Project is given below, all times SLT. For the latest updates and any revisions, please refer to the Seanchai Library’s Dickens Project web page. Friday, December 18th – Trivia and More Tinies! Come dressed for Dickens’ times, but be ready to dance and have fun to the voices and music of two contemporary musicians from either side of “the pond”. From noon through until 14:00 Seanchai Library will be pleased to present to guests at the ball British Songstress Josie Anderton, followed by American Rocker Paul Nowles. A ball not to be missed – so find your best Victorian gowns, your finest Dickensian tailed coats and hats, and come join the festivities! Come join the staff and guests of Seanchai Library from 12:00 noon on Sunday, December 20th, as they present A Christmas Carol from beginning to end in a special pre-Christmas reading (estimated duration 3-5 hours, visitors free to drop in and leave as time dictates). Staves will be read in relay. The Dickens Project is presented in an immersive environment recreating a corner of Dickens’ London. Here, as well as listening to the readings of a Christmas Carol and attending the other special events, visitors can also discover more about Victorian London, learn about the life and times of Charles Dickens and visit many of his works. So do be sure to pay a visit! Kaleidoscope is the name of Krys Vita’s delightful homestead region, which invites visitors to Explore the peaceful tranquillity of both country and nature. visit the two homes, cuddle under the stars. visit the beautiful church or just relax and let magical feel of the sim lift your spirits. And when I say a visit will make you want to do precisely that, I’m not exaggerating. Currently caught in the grip of winter, the region offers a rural setting on which snow is falling, the sky leaden with clouds, the trees raising bared branches towards it. From the landing point, a country track leads inland, border on either side by fence-bound fields. The trees lining the track are frosted white, and have lights hanging from their boughs. Walk between them and you’ll come to a fork in the track. Here sits a little cottage, Santa’s throne outside, the track sweeping left and right around it. Go left, and the track will take you past a barn where horses munch on the grass poking up through the snow, then onwards to the steep banks of a watery channel separating a small island and chapel from the rest of the region, a single wooden bridge offering access to them. Take the track to the right and it will lead you past a frozen pond on one side, the bulk of a house looming through the snow mist on the other. Further along, and across the long grass, sits a large wooden gazebo offering a place to dance and / or play the piano and cello. further on, the track sweeps back towards the chapel island before arriving back at the little cottage once more. Livestock are much in evidence here, furthering the feel of this being a distant farm hidden from the world by the winter snow. As well as the horses, sheep and cattle graze peacefully, while elsewhere rabbits might be found and geese fly overhead. Throughout the region there are places to sit and contemplate, or if you are with someone special, enjoy a cuddle. For the more active, a wooden deck over the frozen pond has a sign offering ice skates, although you might have to get close to it to click it through the snow (or you can click CTRL-ALT-SHIFT-2 to temporarily turn the latter off – although a few other things might vanish with it). You may need to join the region group, tho, to have rezzing right to unpack them – and this may well go for throwing the snowballs on offer from buckets as well. Kaleidoscope also has a Flickr pool for those wishing to add their pictures. and if you do visit, please consider a donation at the landing point to help towards keeping the region available for everyone to enjoy.